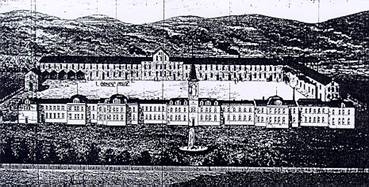 In 1865 Lazarus and Isidor Straus formed the whole importing firm of L. Straus & Son. As this early letterhead shows, they were importers of Crockery, China and Glassware and manufacturers of lamps. When the two other sons, Nathan and Oscar joined the firm, the name was changed to L. Straus & Sons. Caption: The three sons of Lazarus and Sara Straus. Isidor, the oldest son, managed the business affairs of the company. Nathan, the second born, was the natural born salesman. Oscar, the youngest son, spent a brief time working for the company and then went on to a great diplomatic career. Sara and Lazarus Straus had a daughter Hermione. 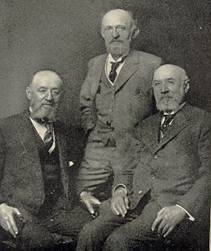 Hermione’s husband, Lazarus Kohns and their son Lee Kohns also had a very active role in managing the firm of L. Straus & Sons. Lazarus Straus and all of his children were actively involved in many philanthropic causes. They became a very influential family in America. As stated earlier, the showrooms of L. Straus & Sons were downtown on Warren Street. In this area many cut glass firms such as Bergen, Pairpoint, Empire and Dorflinger had their showrooms. L. Straus & Sons started out at 44 Warren Street and by 1885 their showrooms went from 42 to 48 Warren Street. They also had branch offices in such locations as London, Paris, Berlin and Yokohma, Japan. Straus & Sons carried quality products and at one time or another they claimed to be the sole agent’s or distributors for such firms as Baccarat, Edward Webb, Minton and Wedgwood. 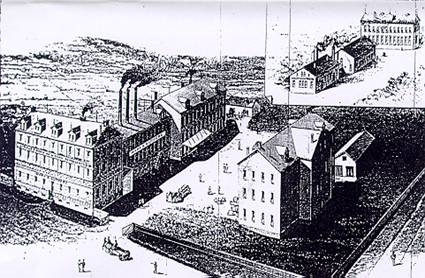 In addition to importing from others, L. Straus & Sons produced their own products in a number of factories in Europe that they exclusively controlled. 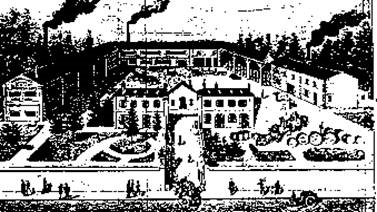 Illustrated below are some of their factories that were illustrated in the Crockery and Glass Journal of January 12, 1893. Caption: 1884 – a porcelain decorating factory in Carlsbad, Bohemia. “Macy’s is the only store in the world that owns and controls its own potteries and decorating shops. We have our own glassware factory at Steinschoenau, Bohemia; our own porcelain decorating plant in Carlsbad, Bohemia; our own pottery at Rudolstadt, Thuringia, and our china decorating plant at Limoges, France. L. Straus and Sons became one of the largest importing firms in the country. Their reputation was based on selling quality products at reasonable prices. They had a knack for knowing precisely what people wanted to buy. The resurgence and popularity of American Rich Cut Glass began in the early 1880’s. The Straus family recognized this new trend and they wanted to become a part of it. As we shall see, the 1874 alliance of these two growing companies, R. H. Macy & Co. and L. Straus & Sons, would have a dramatic effect on the products available to the consumer.